Mrs. Francis Hope (Kerr) Holway was the wife of William Rea (W.R.) Holway, longtime consulting engineer for the Grand River Dam Authority. Mr. Holway, a 1916 graduate of the Massachusetts Institute of Technology (MIT), was the lead engineer on the construction of GRDA’s Pensacola Dam, 1938 – 1940. When that massive construction project — which provided jobs for thousands of Oklahomans during the Great Depression – was completed, Mrs. Holway, who had been a school teacher, put pen to paper to celebrate the monumental achievement by writing a very special poem. Here in mid-summer 2015, as Pensacola Dam and Grand Lake mark 75 years of providing hydroelectricity, flood control, economic development and countless recreational opportunities for Oklahomans, it seems like a good time to revisit Holway’s words, and the dam builders that inspired those words. The public can also read the poem during a visit to historic Pensacola Dam. It is inscribed on a plaque, located on the west end of the dam, at the south end of Grand Lake. 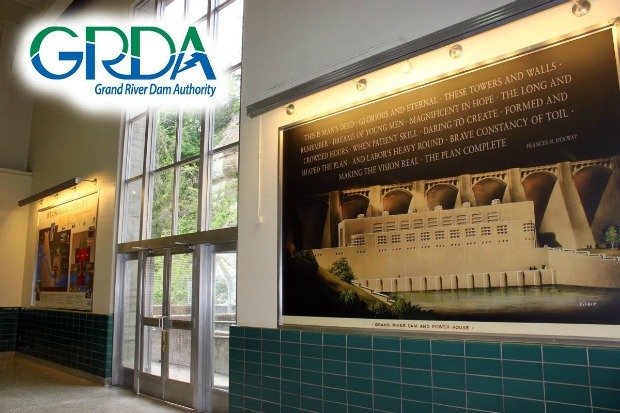 And for those interested in an up close look at the structure the “brave constancy of toil” created, GRDA is offering free tours of the dam, all summer long. They begin at Ecosystems and Education Center, adjacent to the dam, in Langley. For more information, call (918) 782 4726. Photo Above – History on display … Inside the Pensacola Dam powerhouse, the poem about the dam’s construction – “This Is Man’s Deed” – is part of an updated historical display area. As Grand Lake and Pensacola Dam celebrate 75 years of service to Oklahomans, it seems like an appropriate time to revisit the words, penned by Francis Hope Holway. PreviousIt’s a Grand Lake Shootout – Don’t Miss It! My father, Raymond Anthony Galvin, Sr. helped build the Pensacola Dam. He was very proud of his part in that process. He would drive us to the dam and he would let us look through the telescopes at the Dam. A true marvel. I have a house on the bluff in Langley and when I look at the Dam I always think of my dad. Just wonder if you have others submitting memories of their parent who worked on the Dam. That’s awesome, Josie! I’m going to pass your comment on to the folks at GRDA, and thanks for visiting GrandLakeLiving.com!